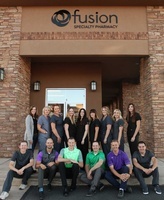 Fusion Specialty Pharmacy is dedicated to formulating creative, individualized, and compounded medications that can improve compliance, maximize the potential for therapeutic success and reduce the overall cost of healthcare. One of our goals is to offer a personalized service to our patients and help them understand their core ailment. This will allow us to work closely with their physicians and create a customized formulation. FSP will offer the personalized attention that the other pharmacies are unable to offer due to their business environment.